Teams live and work with the people of the Red Cliff Band of Lake Superior Chippewa community. Transportant to Site: Meet at designated place in Minneapolis and drive four hours to Red Cliff, Wisconsin. The Red Cliff Reservation was created through a series of treaties between the U.S Government and the Red Cliff Band of Lake Superior Chippewa Indians, the most recent being the treaty of 1854. Chief Buffalo was the “founder” of the Red Cliff reservation. Teams live and work with the people of the Red Cliff Band of Lake Superior Chippewa community, who have invited Xperitas to collaborate through a variety of youth programs as well as at the tribal farm, Minobimaadiziiwin Gitigaanin. This is our newest partnership and we sent our first team of high school students in June 2017. 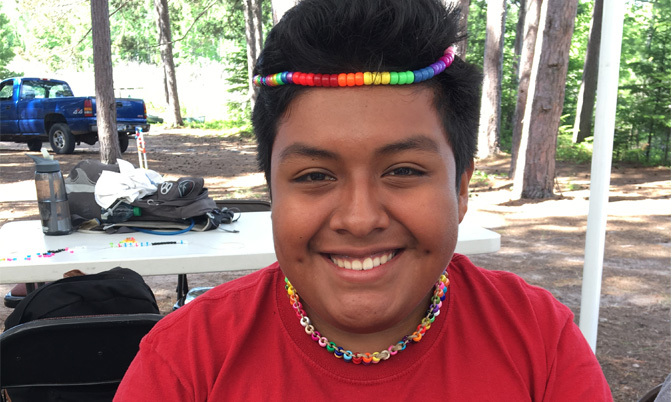 Our first team had the honor of attending Wolf Camp, a retreat for Native youth to learn about traditional Anishinaabe cultural practices, as well as cultivating crops at the tribal farm. Collaborating with the tribal farm by planting and preparing garden beds and a variety of other gardening projects. Exploring Madeline Island with a native elder and learn about the rich native history of the island. Participating in a local youth camp and learn native crafts, traditional medicines, and culture. Building relationships by sharing stories, cooking, or playing games with community members. Reflecting on shared experiences with the team and developing knowledge of the community. Explore the Victorian homes in Bayfield, Wisconsin and shop in stores that feature local art and gifts. Visit a nearby orchard or pick berries at a local fruit farm. Kayak the Apostle Islands or plan a hike on one of the 40 beautiful trails. Contact us to learn more about programs to Bayfield, Wisconsin.